john4jack (Corvallis, Oregon, United States) on 25 August 2011 in Architecture and Portfolio. Note: I replaced the original photograph with a Lens Corrected version at 11 AM, PST. Personally I like the wide angle effect of the original post. @Duck Island Guy: Thanks. Where have you been, Duck Island Guy?? Great colours and textures in the wood. I feel I want to walk along it. The reflection in the window is the icing on this cake ! As I really didn't understand your com yesterday, just few words to tell you that there is nothing madantaroy leaving words if the images, the work doesnt "talk" to you. You are free not to write words. I prefer nothing to read rather that systematic coms. Superb lines and beautifully balanced exposure. The colours are stunning,so is the compo! A beautiful shot! Really impressive colors. And nice perspective. Superb and great strong colors ! Brilliant. The color is my morning wake-up. Very vibrant and vital ! The crop, the angle, the perspective, the reflection....ahhh, pure art !! The exaggerated colors and the slight tilt to the shot combine to make a surreal feeling image that is very impressive and eye-catching. Super job of processing and presentation. Fabulous perspective and amazing tonality! Such a strong and intriguing atmosphere! Wonderful work! Superb colors and light! Beautiful shot! Amazing rich colors and textured detail, beautiful light! Gut im Licht und in den Farben. Colors are absolutely magnificent Jack but I have a small regret that the horizon is tilted so it's a pity for a so fantastic photo! Reflection in the window Ronnie? A beautiful shot, Jack. I think this is an HDR. If so, how many frames did you use here? I love the colors you captured. @Steve Rice: 5 frames - straight shot, one and two stops over and under. A very nice angle of view and perpective with an outstanding work on details and colors. Must be enjoyable to spend some days there. Great HDR indeed. A shot with an immediate impact through its angle and colors. Nice work. Wondreful leading lines that draw you into this compo! 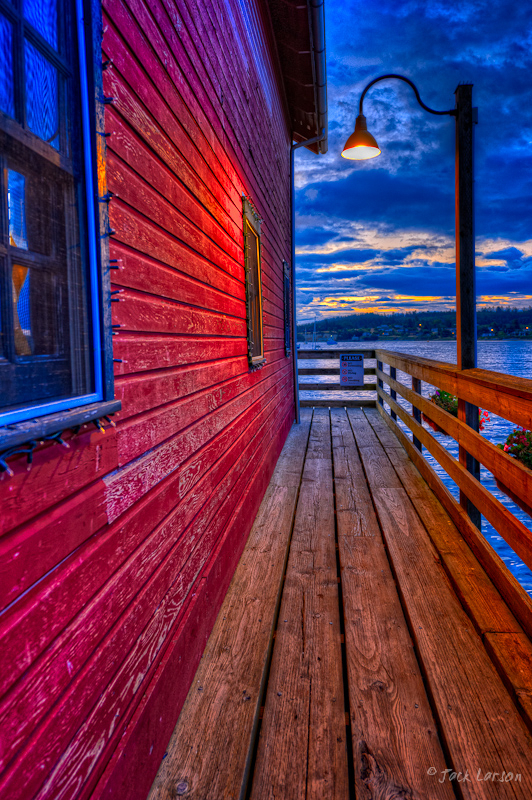 Great colors and wooden textures. Makes me curious to see the view around the corner.....Great rich colours! I really like the perspective in this bold image. Jeu de lignes et couleurs au top. Une belle réussite. Fabulous colors and love this point of view, Jack. absolutely great! nothing wrong, perfect! Wow! I love this one! Well done! Brilliant color. Your image has terrific impact. I love the colours and angle! Great shot.